In recent two years’ basel world, Omega published a lot of outstanding watches, the Seamaster watches they published are very practical, but also at affordable prices. Although the Seamaster was not that professional like Submariner, it has their own distinctive design features and has won a lot of watch fans from Rolex community. The Spectre 007 Limited Edition, which was unveiled two or three years ago, created a sales storm in replica watch market. 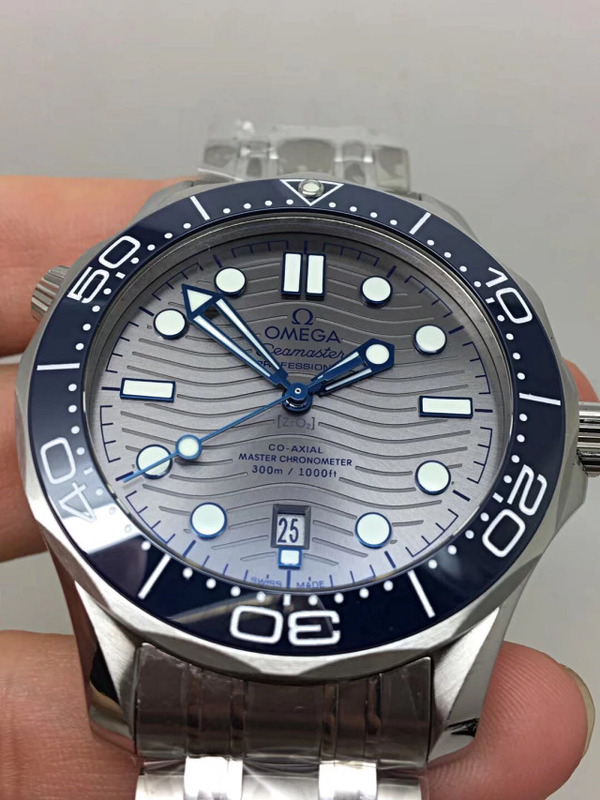 More than three watch factories have replicated this watch, KW even improved this replica several times and finally released the ultimate edition two months ago, you can red the latest version review of replica Omega Spectre here. 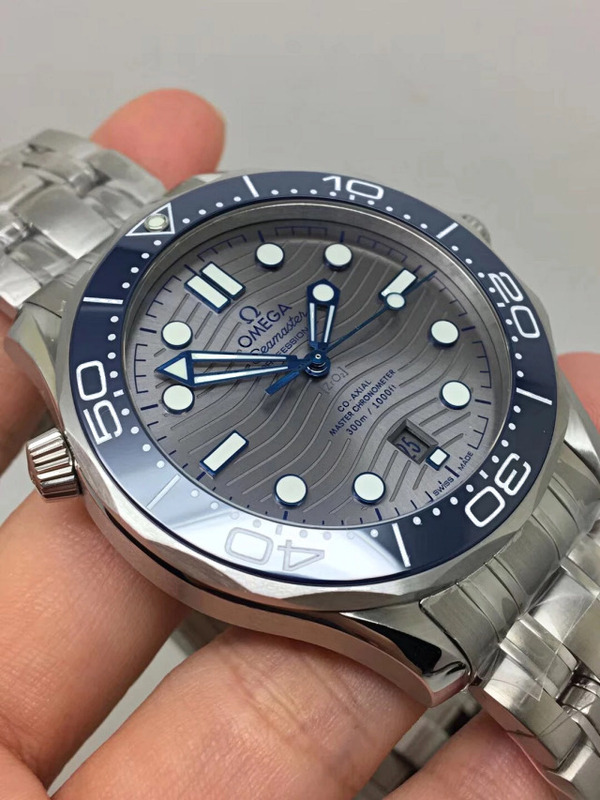 Now, the Omega Spectre from KW factory is not always in stock, sometimes after placing your order, you need to wait for a long time for the watch to be shipped out from the factory. 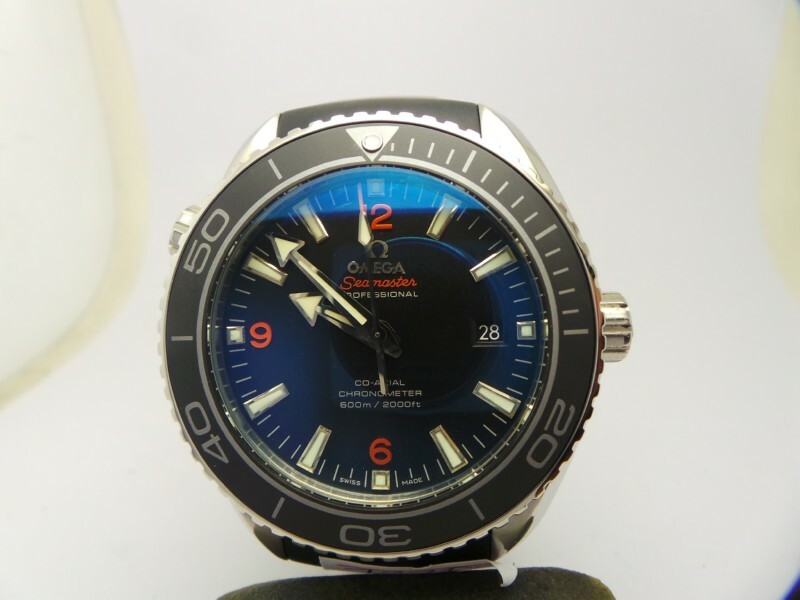 So, instead of wasting time to wait for it, why not consider another good quality Omega Seamaster Diver replica watch. 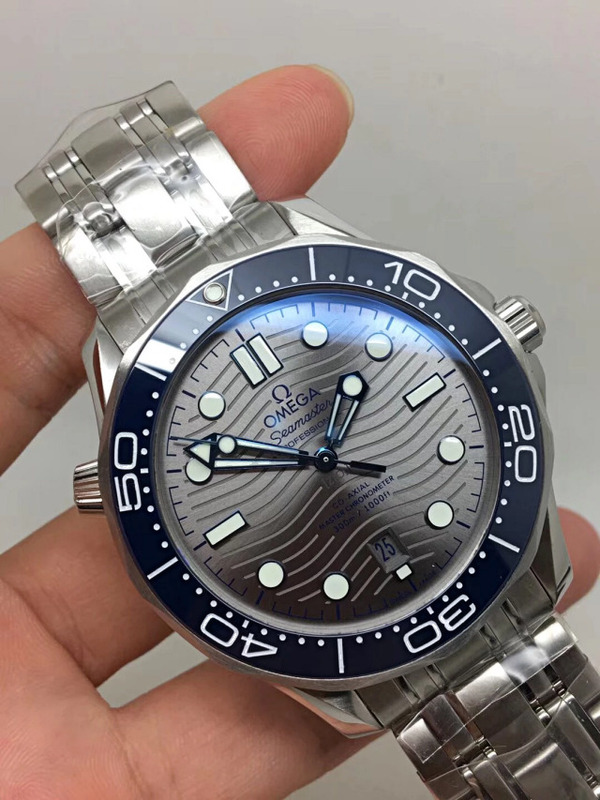 Today, I am exactly going to introduce such a type of Seamaster, it is the new model in Basel 2018. Compared with previous Seamaster watches, this new watch has some fresh new features. The blue ceramic bezel looks fresh, on most Seamaster watches Omega published before, the bezel is usually in black ceramic or metal, the blue bezel color looks more attractive, also meets the ocean theme Omega Seamaster wants to express. The white engraved markers have platinum coating that will never fade. The dial also has several new features that could not be found on previous Seamaster. First, central three hands are blued steel, which exactly echoes with the blue color on ceramic bezel. Hour markers have blue steel frame and are filled with white luminescence. 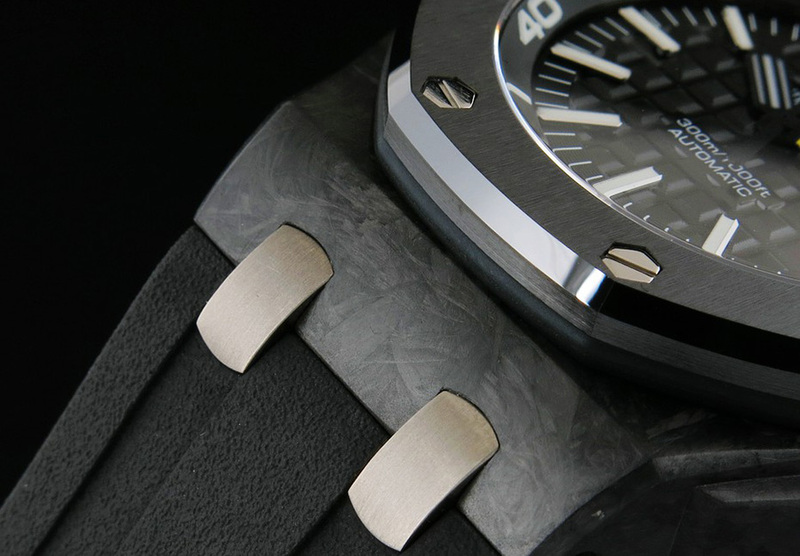 The wavy textures on grey dial make the watch so unique. There is a date window on top of 6:00 marker, the window has a silver grey background with blue date font. 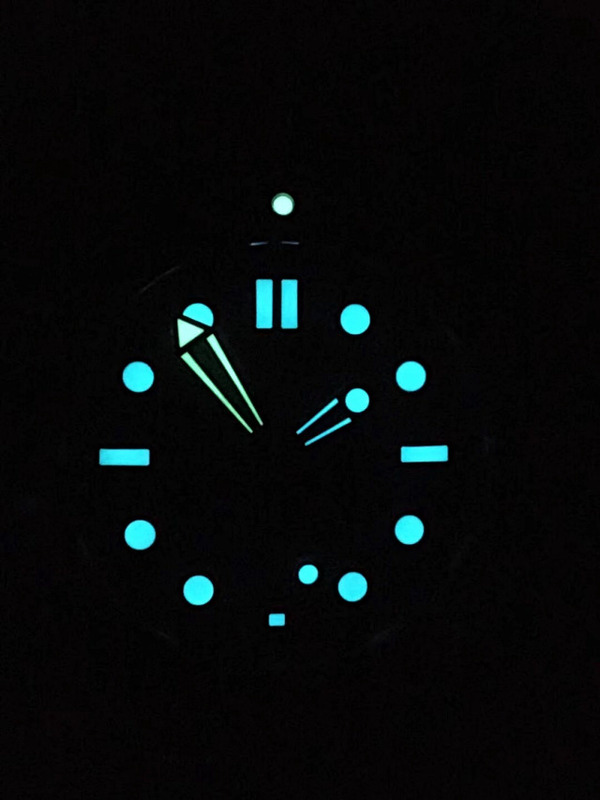 The dial has two different lume light, this is the same as genuine watch, please check it in dark place. Through the transparent crystal case back, you can see the mechanism inside, it is a Co-Axial 8800. 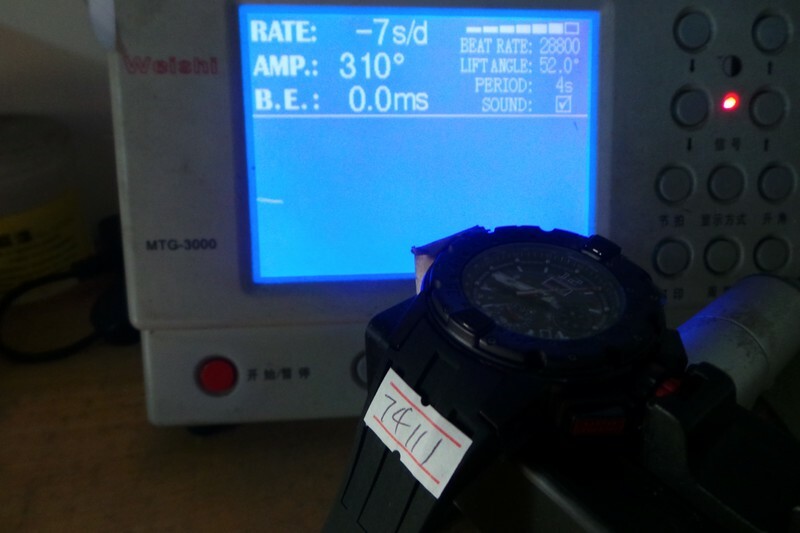 Although it is an Asian clone 8800, the movement does not have difference in outlook and function when being compared with genuine Omega Cal.8800. Because VS factory already has the experience in cloning Omega Cal. 8500 that is equipped in Seamaster Spectre 007, so this 8800 is also a super clone and independently developed by VS maker. 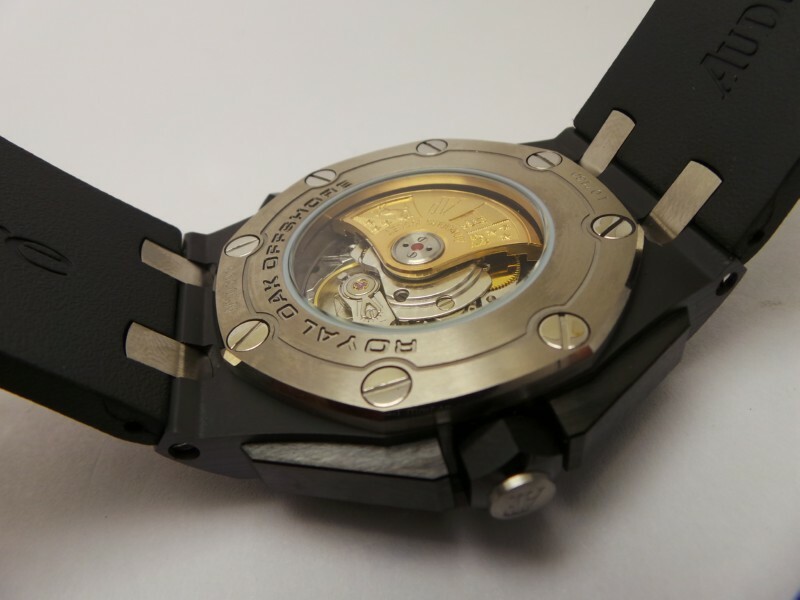 The decoration and OMEGA SEALS on movement plate and auto rotor is very close to genuine Cal. 8800. This replica was just published by VS, I think they will continuously improve this movement and release V2, V3 or even higher version of this replica in the future. The following are some basic details of the replica, please read if you have decided to buy it. 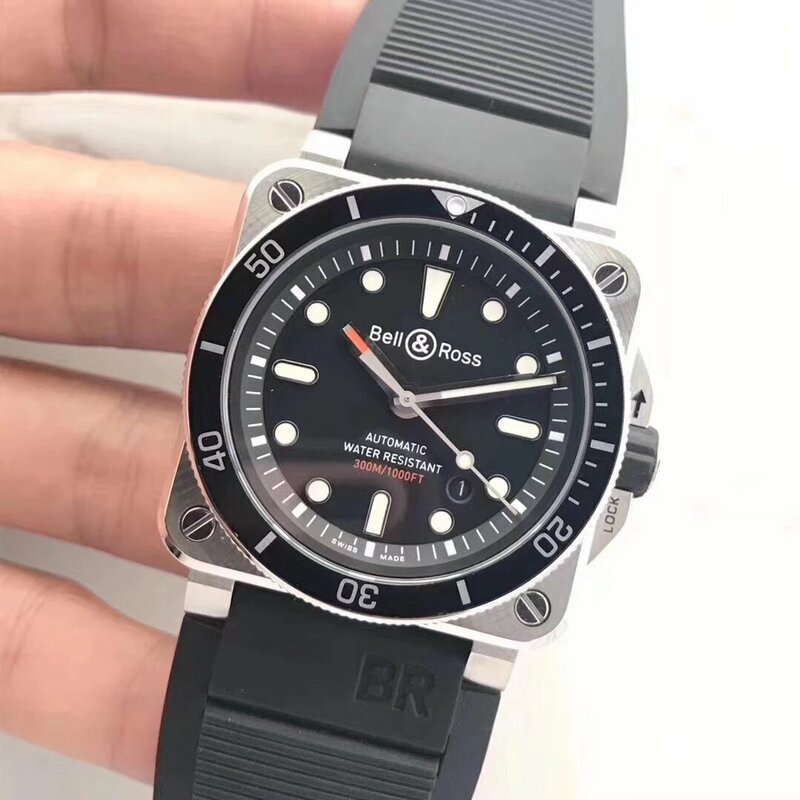 I seldom reviewed Bell & Ross watches on my blog, two days ago, I was back from my home town and went to the watch market, I found an amazing replica Bell & Ross watch, it is exactly the watch I like because of its diving style. The watch not only has all features which you can find on diving watches, but is full of mechanical feeling. 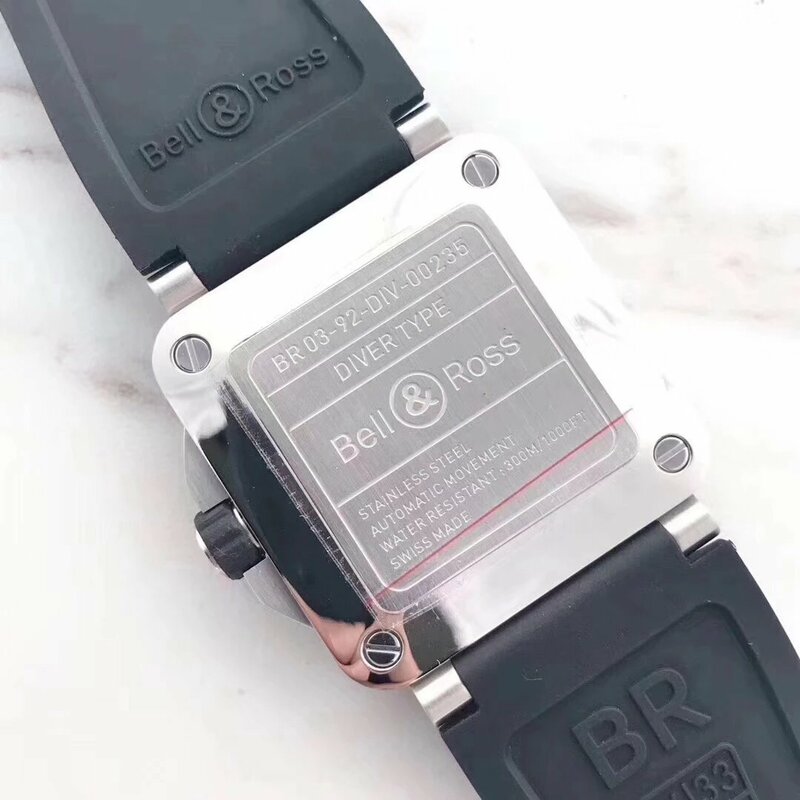 BR03-92 Diver Type is the first diving watch of Bell & Ross in square shape. 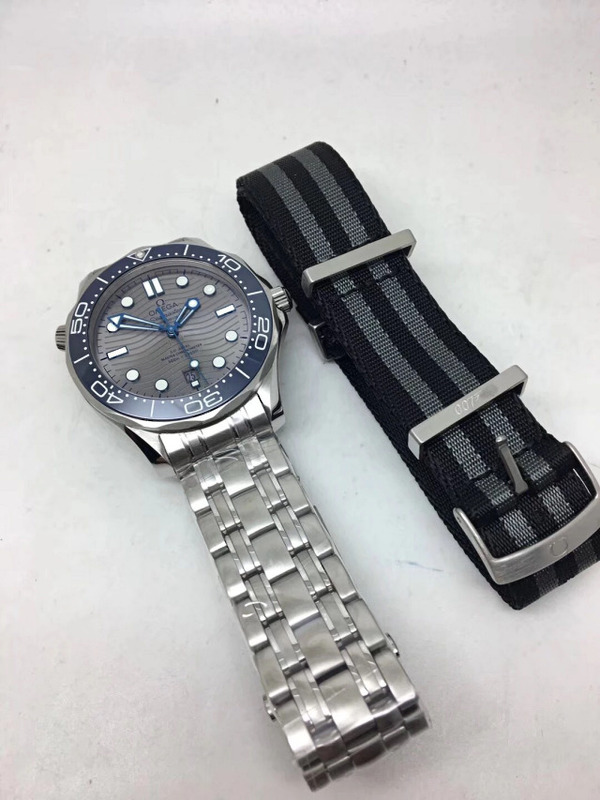 On reason I like this watch because diver’s watch is always one of my favorite, the other is it has two types of band shipped along with the replica, black rubber and nylon strap. Two different types of band in black color, this is very cool. Both rubber band and nylon strap are suitable to be worn for diving. 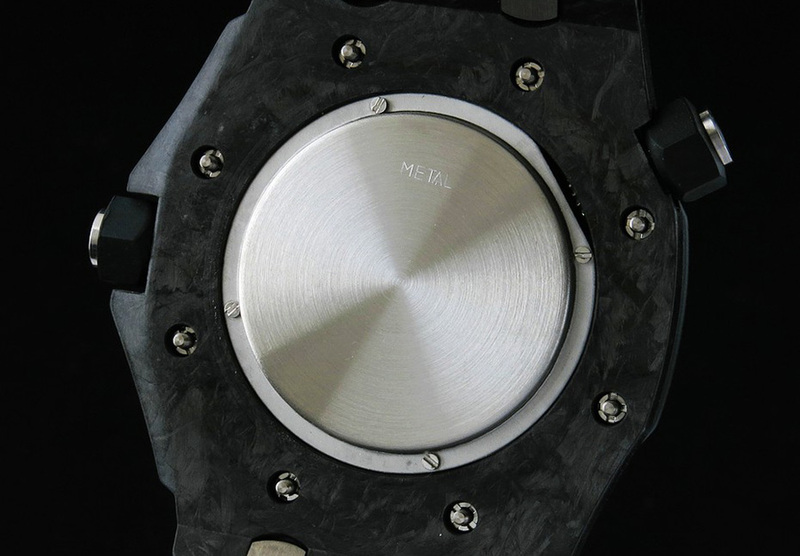 The case of the Bell & Ross Diver replica is made of 316L stainless steel, case size is measured to be 42mm*42mm, it is 11mm thick, solid stainless steel case ensures the watch to be able to withstand harsh exploring conditions underwater, protect the complicated mechanical structure and function. The case is also reinforced by solid and strong case back to ensure an extremely high pressure underwater. Like genuine Bell & Ross BR 03-92 Diver, this replica also features a soft iron inside the case to improve its anti-magnetic performance. 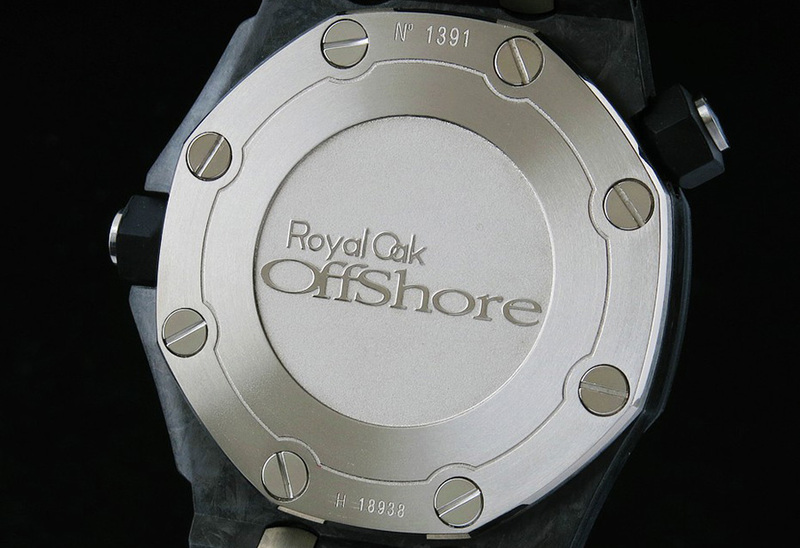 On case back, there are engravings telling you the watch series, case material, movement type and water resistant depth. 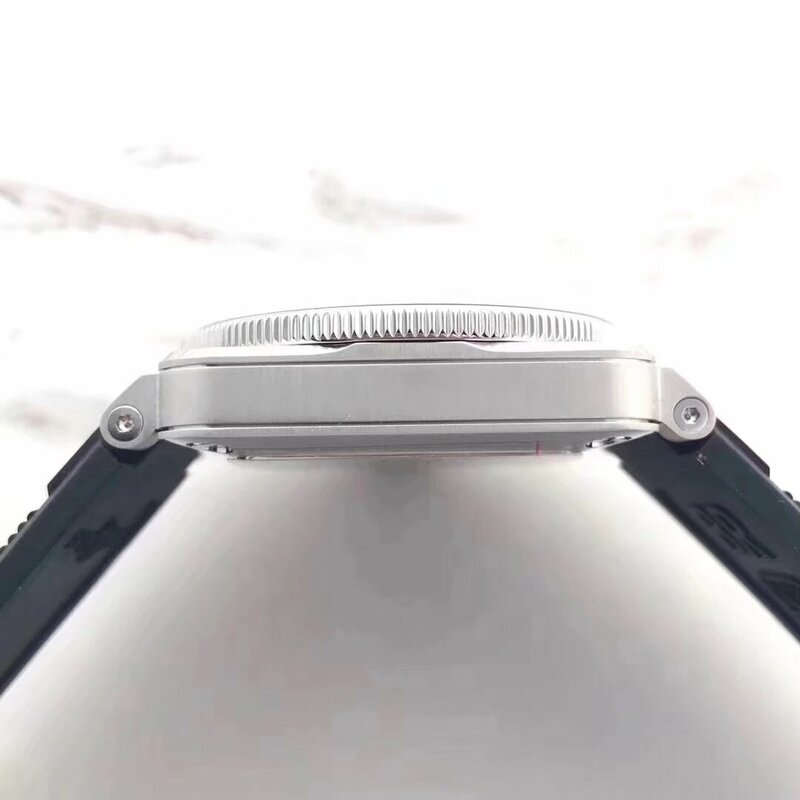 Another factor that provides this watch with a superior water resistance is its sapphire crystal, which is measured to be 2.85mm thick, this is amazing. The surface of the sapphire crystal is applied with anti-reflective coating. 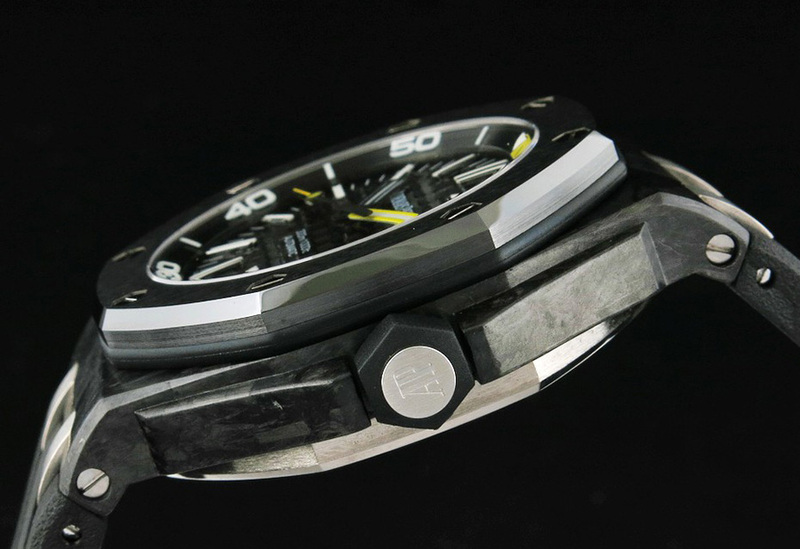 Black dial and white hour markers form a high contrast, so that the wearer could read time easily. Like genuine watch, the replica Bell & Ross watch is also applied with Superluminova on hour markers, minute hand and second hand. The hour hand is different, it is in orange color. Besides, the minute hand is also for you to know diving time that could be read from the bezel. At 4:30, there is a small round window, yes it is for date display. The layout of various elements on the dial is full of layered feeling, very reasonable. 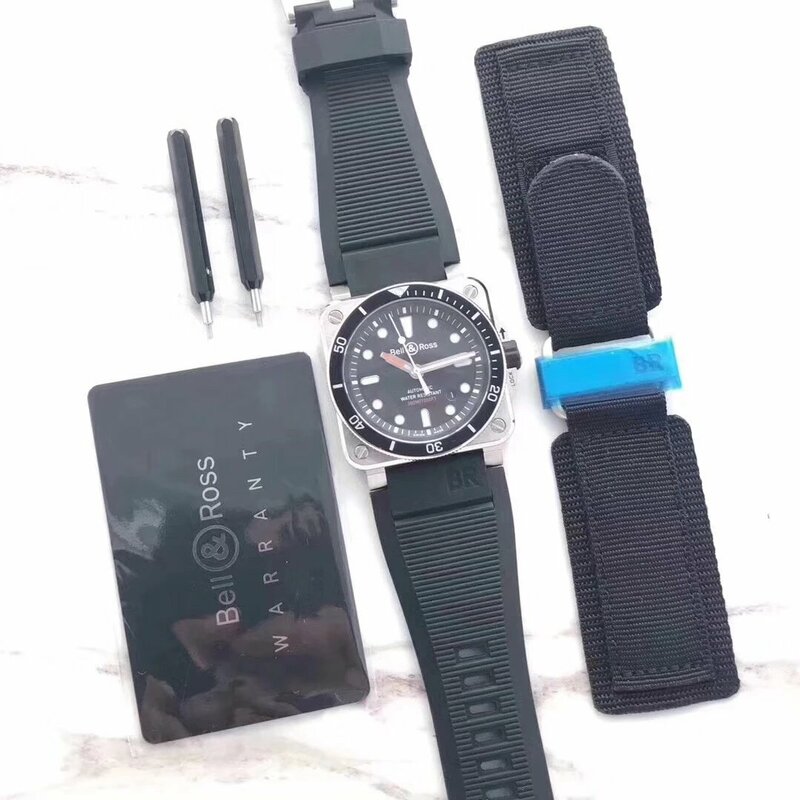 Last, like we mentioned above, the replica watch comes with black rubber band and nylon strap, as well as one pair of screw drivers for you to change the band. Having read a lot of watches reviews on my blog and still can not decide to buy which one? 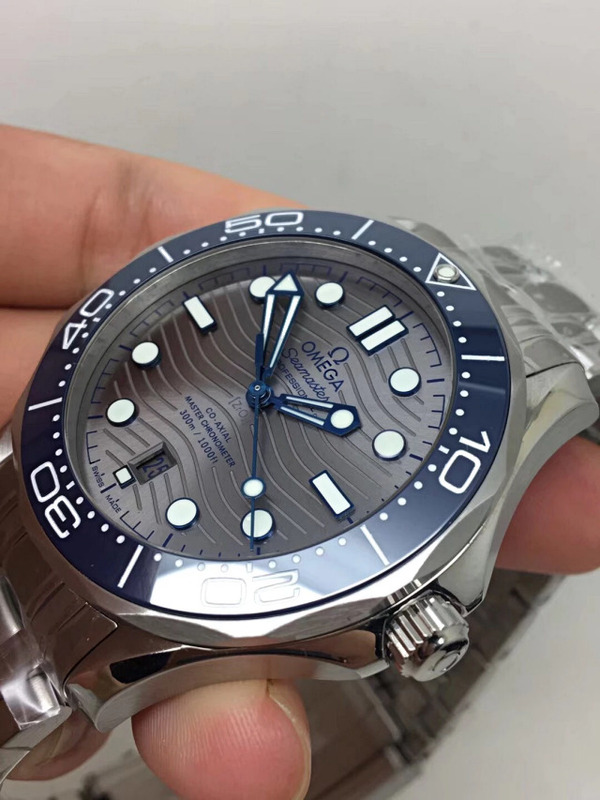 From today, I will spend several days to write some recommendation reviews to help you guys to choose the best one in these top lists, which include top 5 diver’s watches and top 5 dress watches I will introduce in the following two posts. 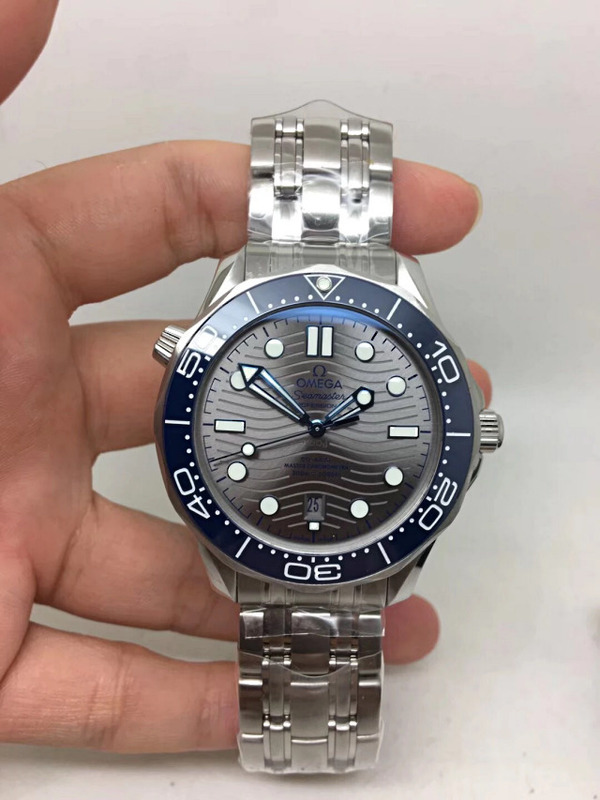 Today, the top 5 hot sale diver’s watches come first, in this article, I will give a short introduction of each watch, you can choose the one that mostly fits your style. Rolex is the best-selling watch in the world and Submariner is the most popular series. 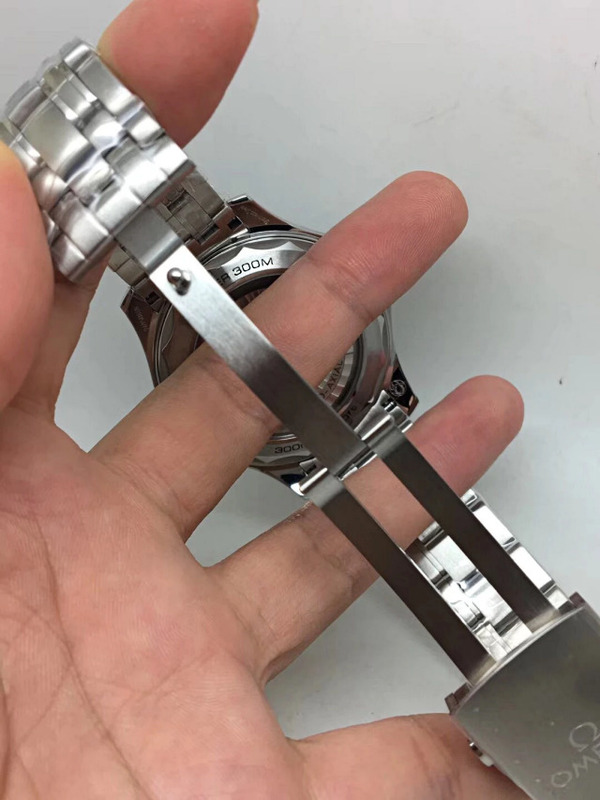 In Guangzhou watch market, Rolex is the brand which factories mostly love to replicate. 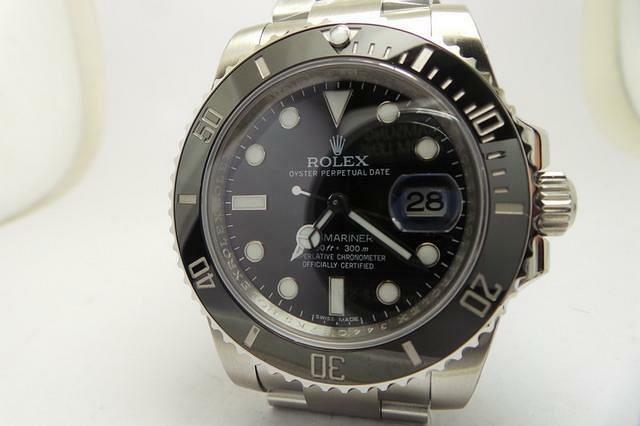 116610 LN Black Submariner has always been the object of each factory. Ultil now, there are basically 3 factories having manufactured Rolex 116610 LN, they are BP, Noob and J12, certainly the best edition is from Noob, which is going to release V7. So, V6s on the picture is currently the best one. 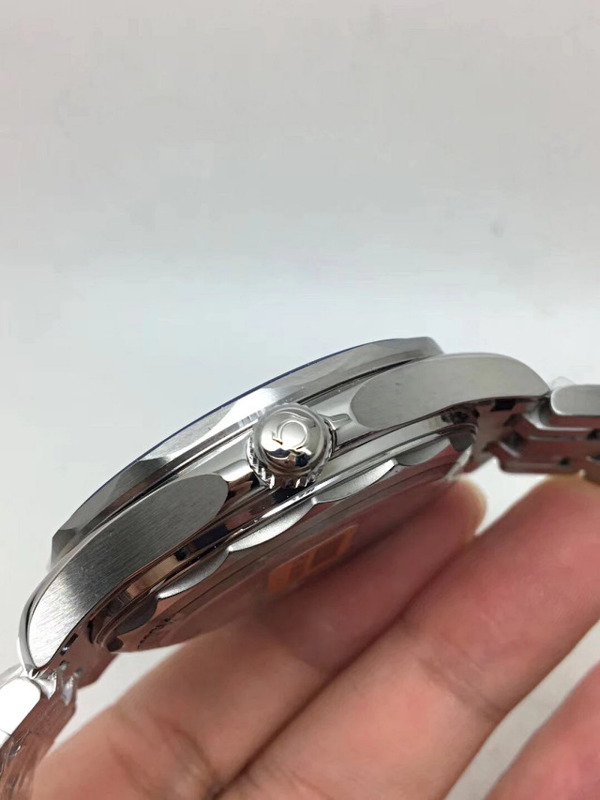 From case polishing, dial detials and movement, Noob 116610 LN V6s do the best, you can choose ETA 2836 and Super 3135 to be installed. 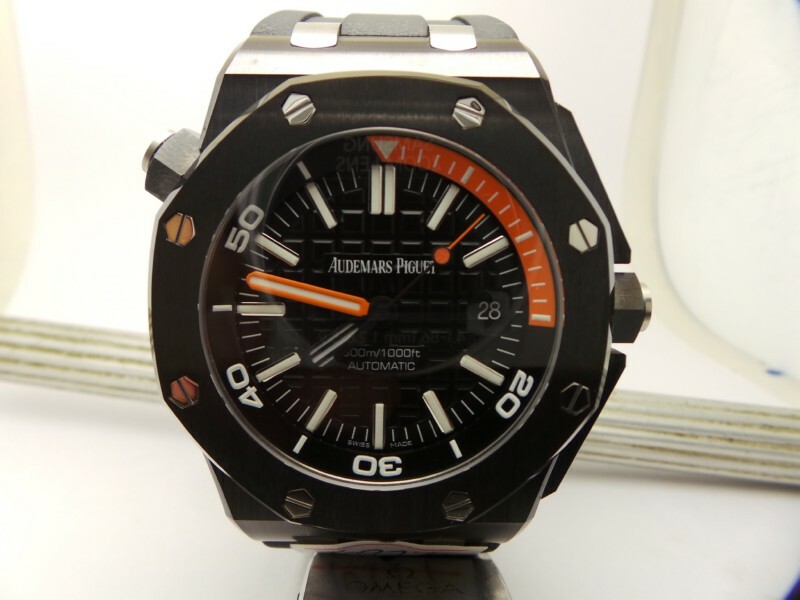 Audemars Piguet Diver 15703 has a large amount of sales in diver’s watches. 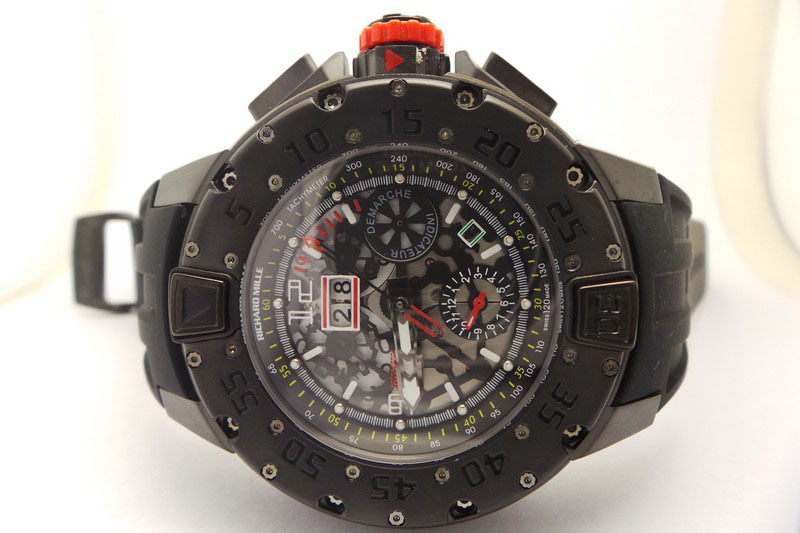 Every one in the watch forum will recommend you 15703 when you are searching for a good diver’s watch. Its extremely thick case can resist shock and you do not need to worry it will be broken during shipping. 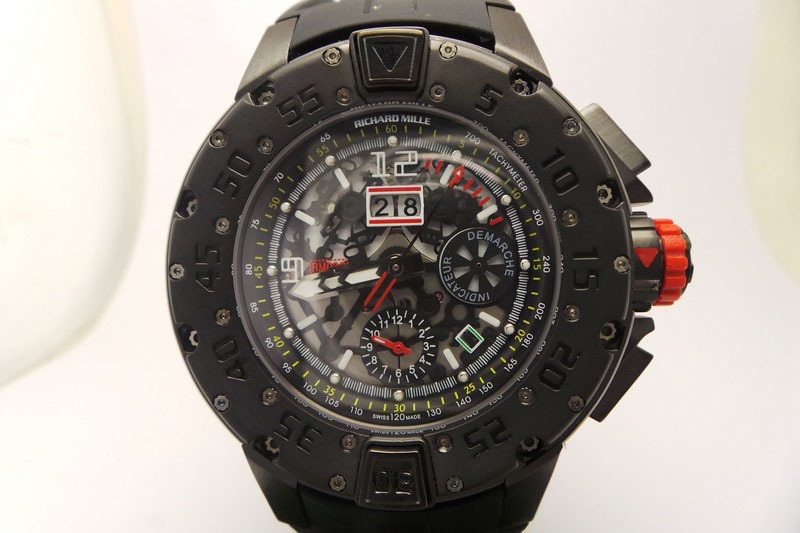 Besides, the movement inside 15703 is Sea-gull 2824 that owns a low repairing rate. Currently 15703 is replicated by Noob, H and J12 factories, but I still recommend Noob version, whose stability and accuracy have been tested by our wearers. Besides our best seller Spectre, Planet Ocean is the hottest Omega diver’s model. BP, Noob and KW all make this watch, I will recommend BP version this time. BP Planet Ocean has a better movement stability. 42mm case diameter makes Planet Ocean more suitable than other diver’s watches. Black ceramic bezel will not fade if you did not scratch it. 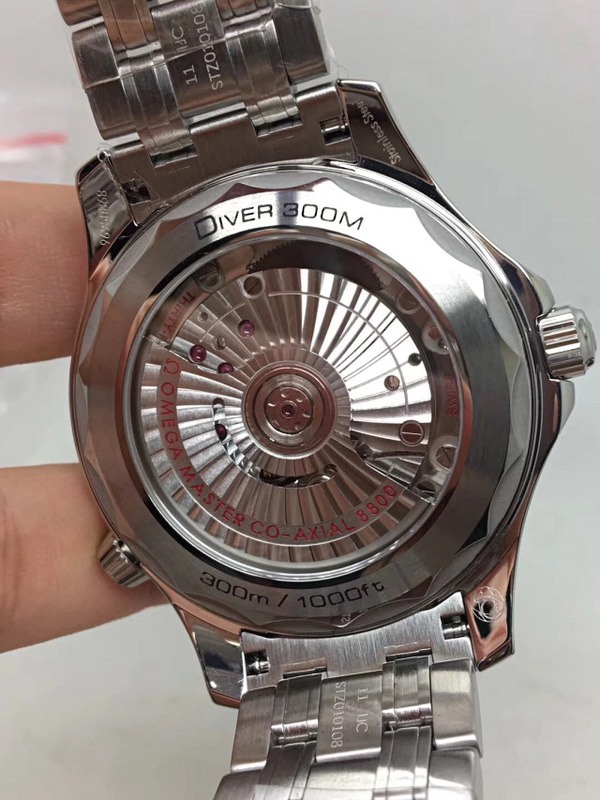 By the way, BP Planet Ocean uses clone 8500 calibre, its movement plates and auto rotor are decorated perfectly, from the see-through crystal back, the fake movement looks the same as genuine. The Black Bay is the earliest Tudor replica released in our market. 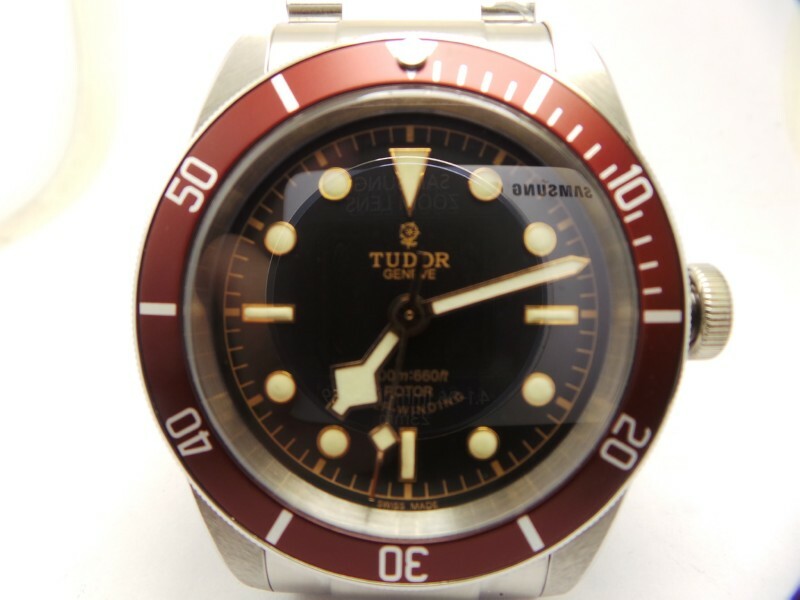 ZF made the best version and Tudor Black Bay indeed raised a storm in watch market in 2014 after it was released. Some people buy it because of its charming red bezel, some buy it because the Sea-gull 2824 is very stable and accurate. I have worn one Tudor Black Bay to the boutique and compare it with genuine, all details of ZF Tudor Black Bay looks the same as original, even the watch expert there can not tell it as a fake. 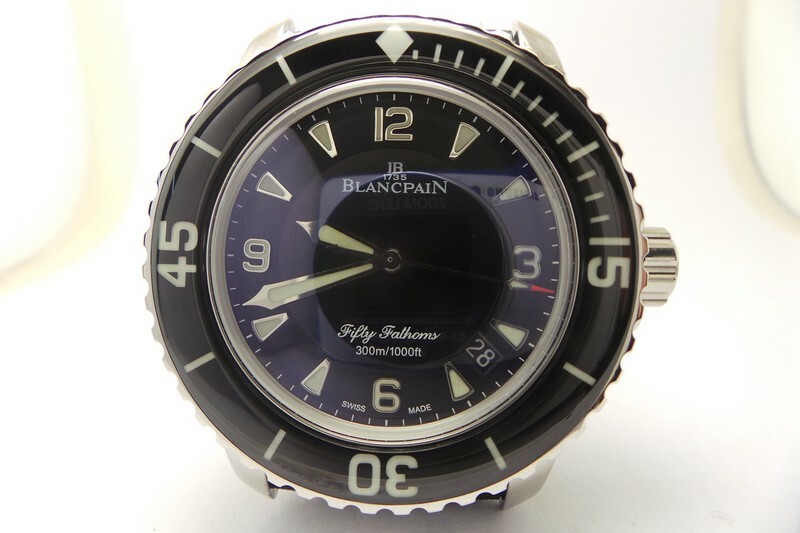 Blancpain Fifty Fathoms replica has the highest price among this top 5 watches list. Made by Noob, Blancpain Fifty Fathoms features a sapphire crystal bezel, that’s the biggest difference between it and other brand watches. 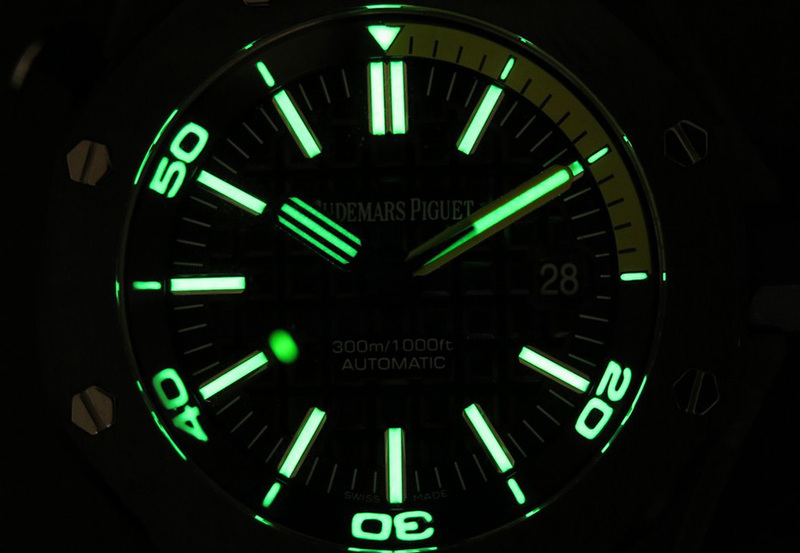 The bezel markers and hour markers as well as hands all use original Swiss Superlume material, so the watch will emit a strong green light in the dark. 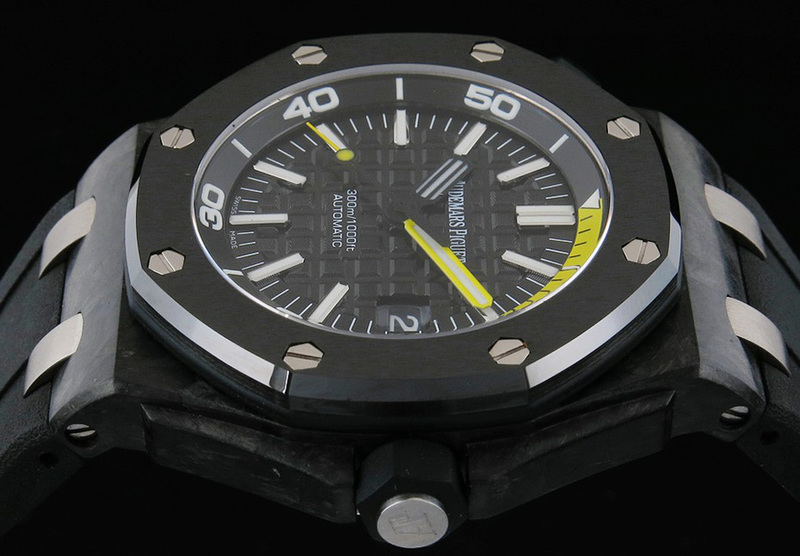 Ok, the articles above give a sumarry of top 5 best-selling diver’s watches, which one is the best style you want to own? Richard Mille has gained their high popularity in recent years, with the cooperation of tennis sports superstar Rafael Nadal, Richard Mille is more and more popular and has released many unique models such as diving watches, skull watches and others. Today, the watch I am going to introduce is a replica of Richard Mille RM025, it is a big watch whose case diameter is in 50mm, bigger than most Panerai watches. Actually I do not think it is more popular than my favorite Panerai watches, because the dial of Richard Mille watches are not very clear and big, which means that I can not fully read the time and other information from its dial design. Maybe this is the reason that makes the Richard Mille so unique among sports watches. 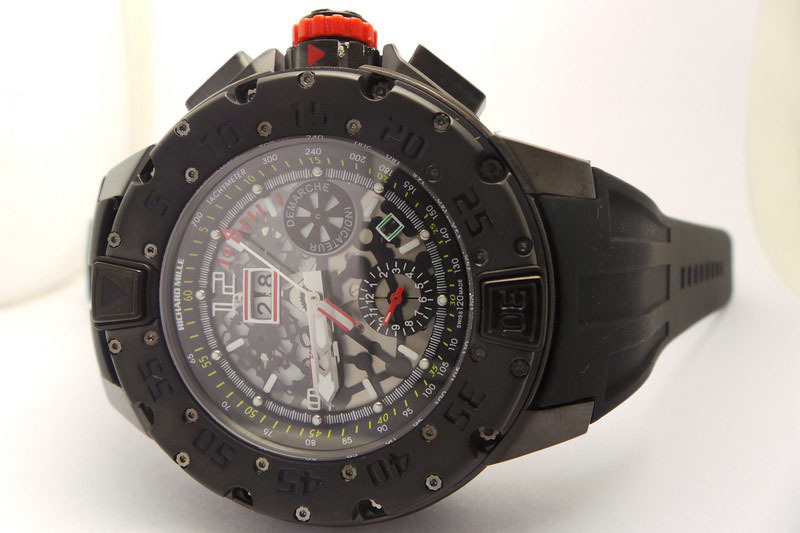 The replica Richard Mille RM025 Diver watch seems to be very strong and solid just judging from its tough case, which is made of 316L stainless steel and coated with black PVD, the whole watch uses black and red colors design, which is very fashionable, main black tone and red color on rubber button and dial details. The bezel of the replica watch is wide and easy to rotate, which fully meets the diving standard in deep sea. Well, I like see-through caseback design because it allows me to appreciate the movement, also lets me to check whether the replica watch is high end or low. The movement inside the Richard Mille RM025 replica is Asian Valjoux 7750, which features full chronograph function, movement rotor is skeletonized, it is like genuine ETA 7750 movement that beats 28800 times per hour. The movement plates has beautiful fish scale patterns. Because it is a clone 7750 movement, so it is normal when you see the watch is 7 seconds slower each day. 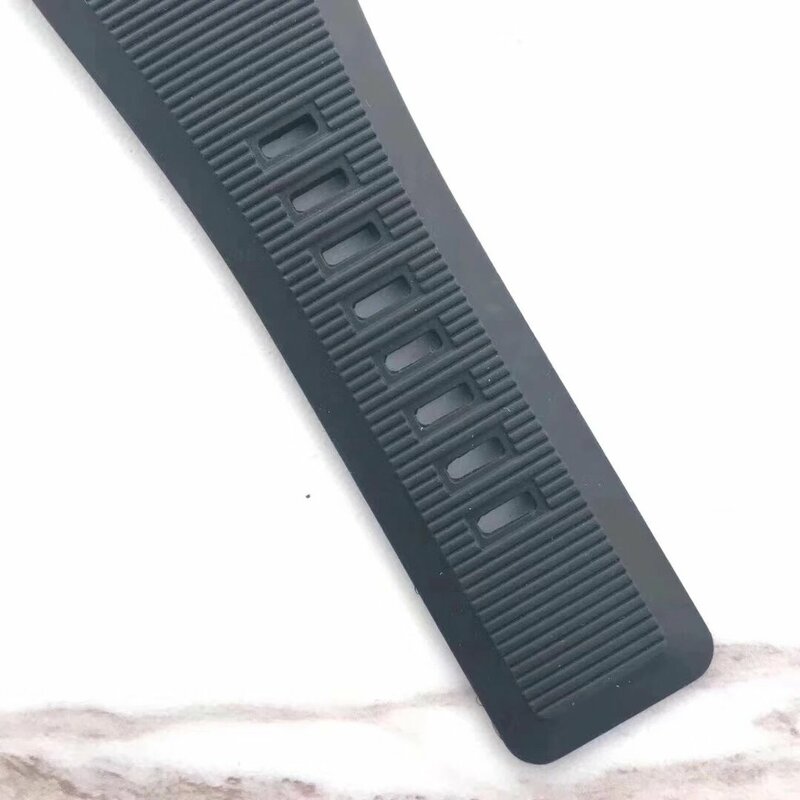 The replica watch features a thick black rubber strap, actually the rubber band fitted on most high end replica watches are manufactured by big factories, so it is in high quality and brings you superior wearing comfort. 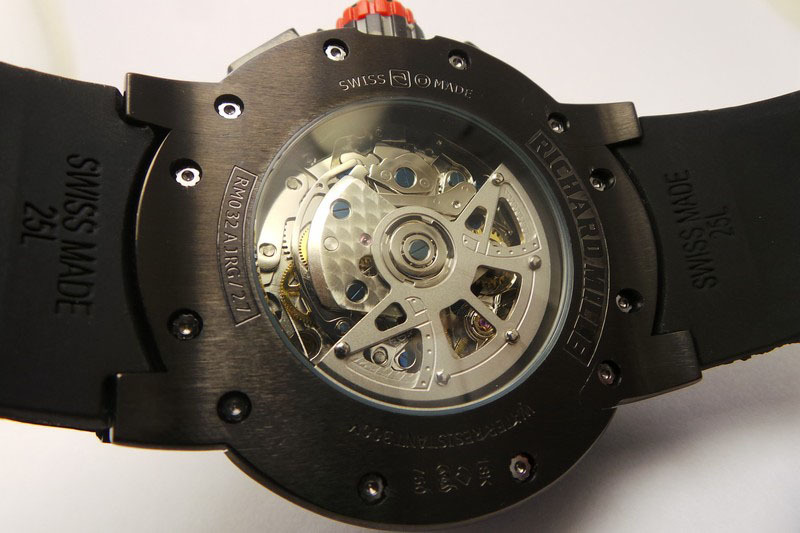 The Richard Mille is a superior quality replica watch, it completely worthes its price tag, although almost at $480. 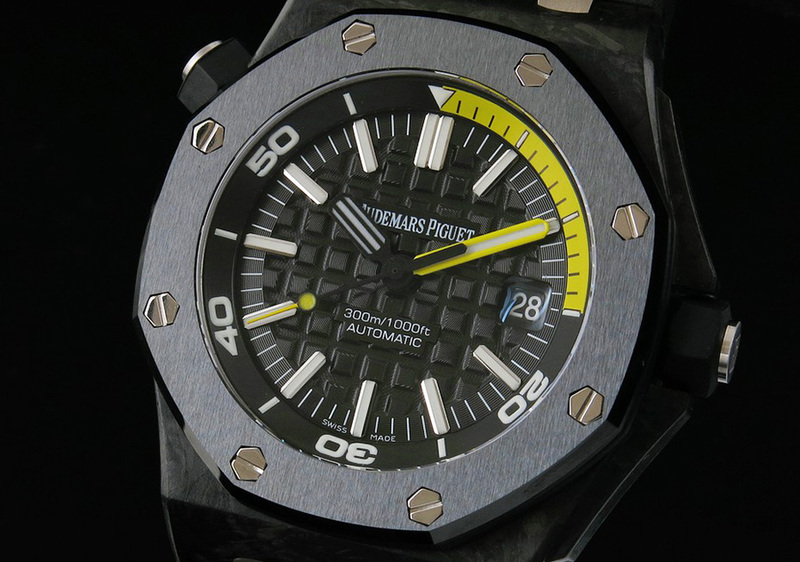 Audemars Piguet Diver is one the mostly replicated watches in recent years in fake watch industry. 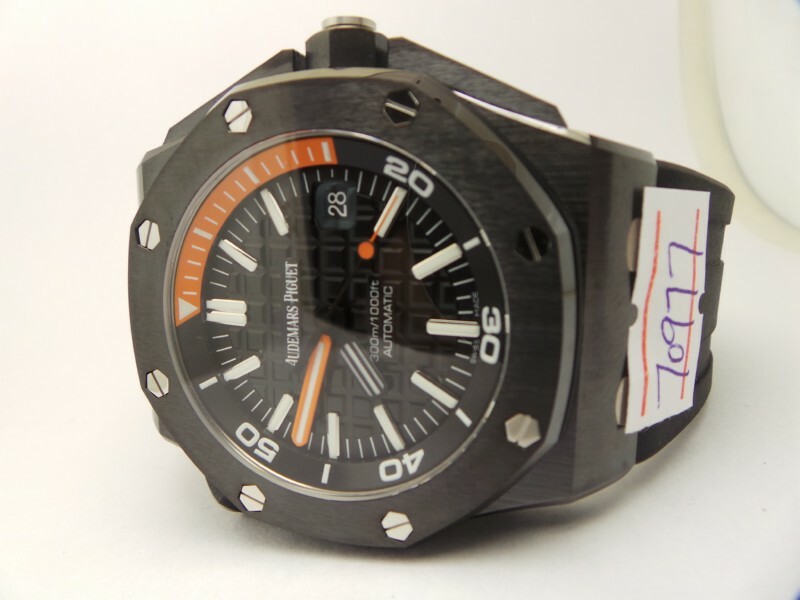 There have been comparison between replica and genuine AP Diver several years ago in forums, these comparison reviews not only make Audemars Piguet Diver replica more and more popular, but also let the watch factory continue to improve details. 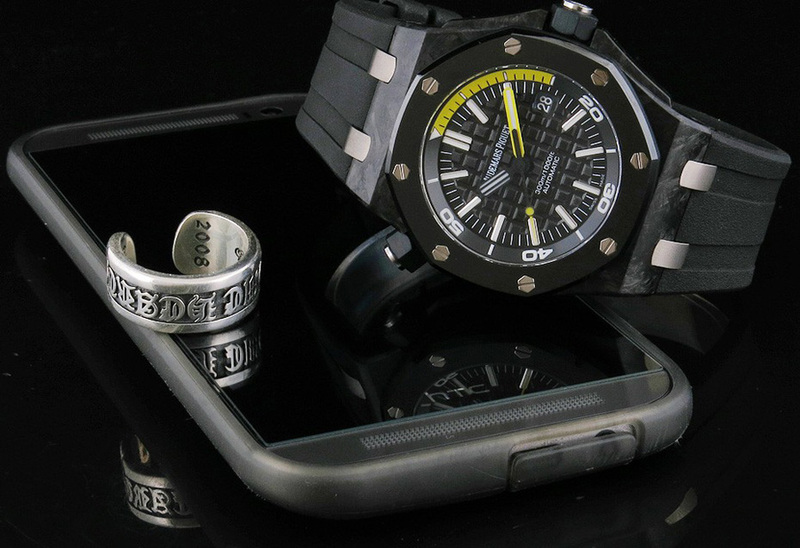 In the beginning, the best AP Diver replica is made by H and Noob factory, today, J12 joins the team and released several editions, each is said to be the best in replica watch industry. 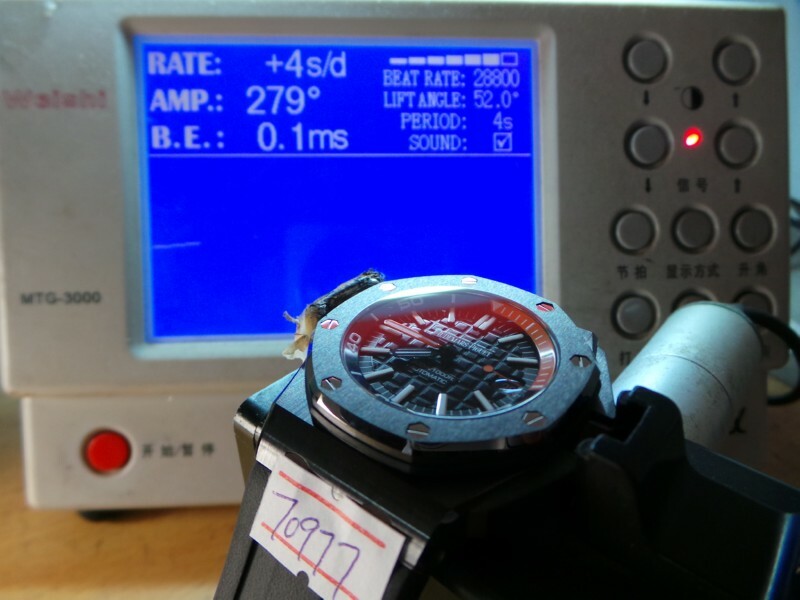 This watch I will introduce in the following is a replica of Audemars Piguet Diver 15707CE.OO.A002CA.01, the manufacturer bought a genuine watch and tear it down to make their replication work. It is a real 1:1 replica watch from the gen, before the case and bezel are forged carbon, now they use real ceramic case and bezel, the dial lume is also as strong as genuine watch. 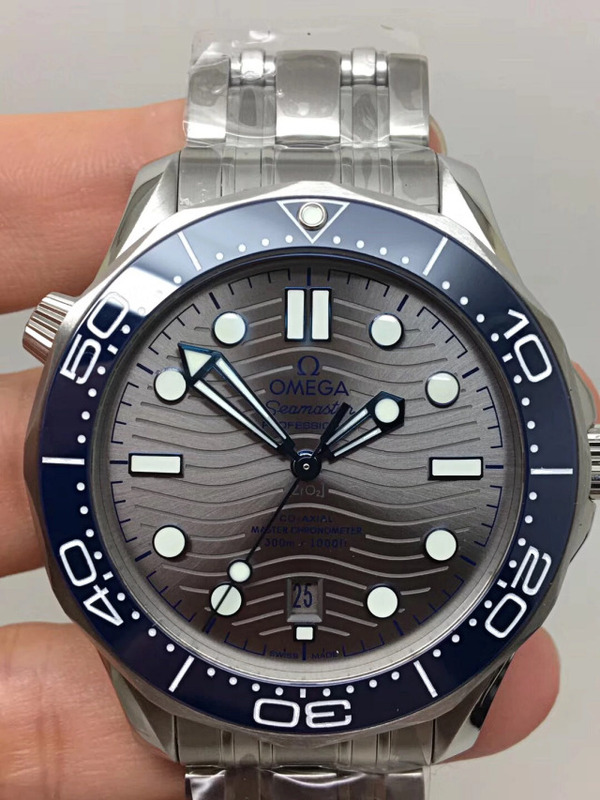 The dial is clearly readable, besides the grids in black background, all hour markers are coated with white luminescence, the minute hand has orange edge, in the center, there is white luminescence material coating, the central second hand also has orange tip end. 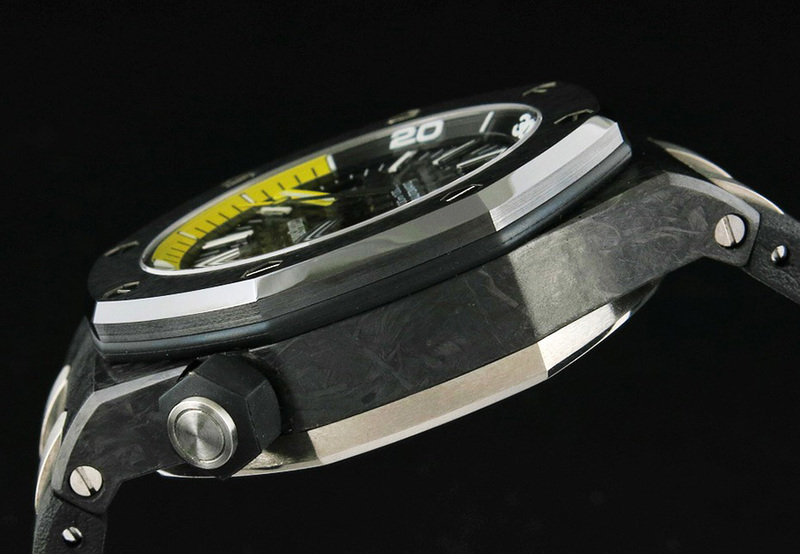 Black rotating inner bezel is like the genuine, with orange diving scale from 60 to 15 minutes. 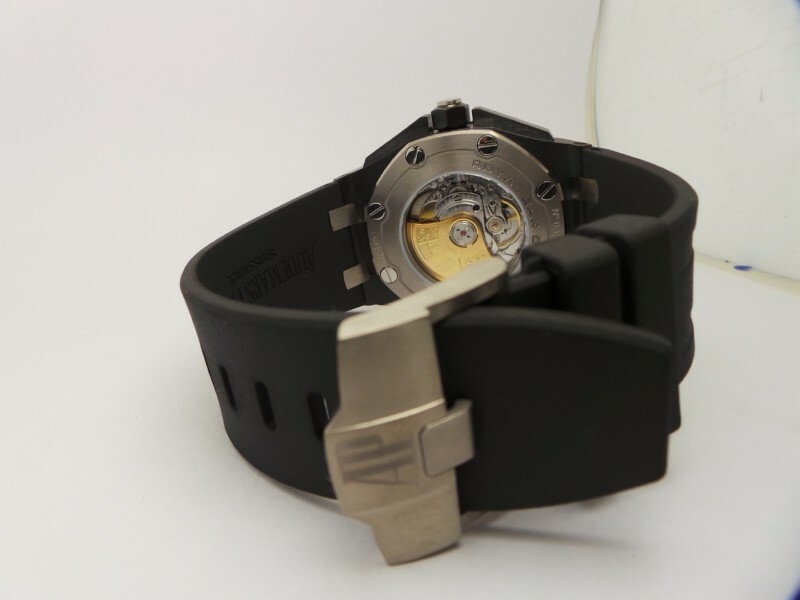 The black rubber strap is wide and soft, it seems the band is wider than that on other brand watches, brushed buckle on rubber strap, large AP word is satin finished, you will feel good texture on the buckle of this replica Audemars Piguet Diver watch. Through the sapphire crystal case back, you will see the heart of the this replica watch, it is an Asian ETA 2824-2 movement, nickle plating on movement plate, golden auto rotor has information engraved, take a closer look at, you will see beautiful Geneva Stripes on movement plates. 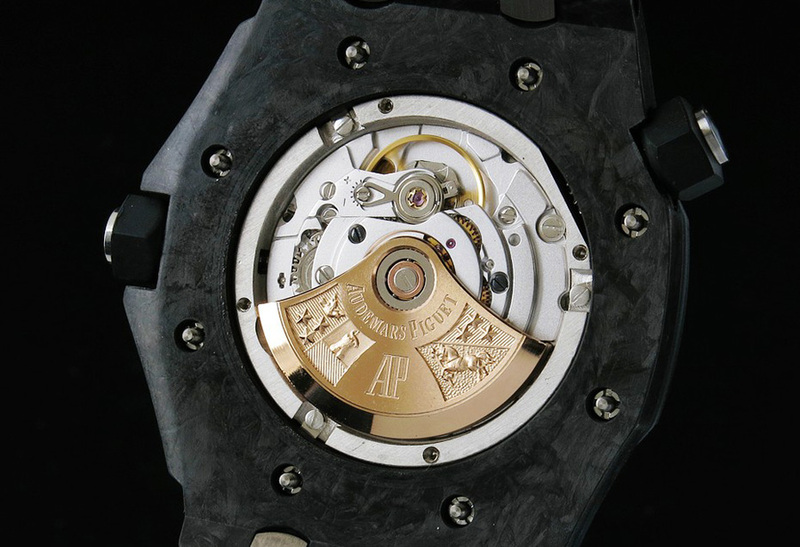 In a word, this replica Audemars Piguet will be one of the highest quality replicas you have ever seen. 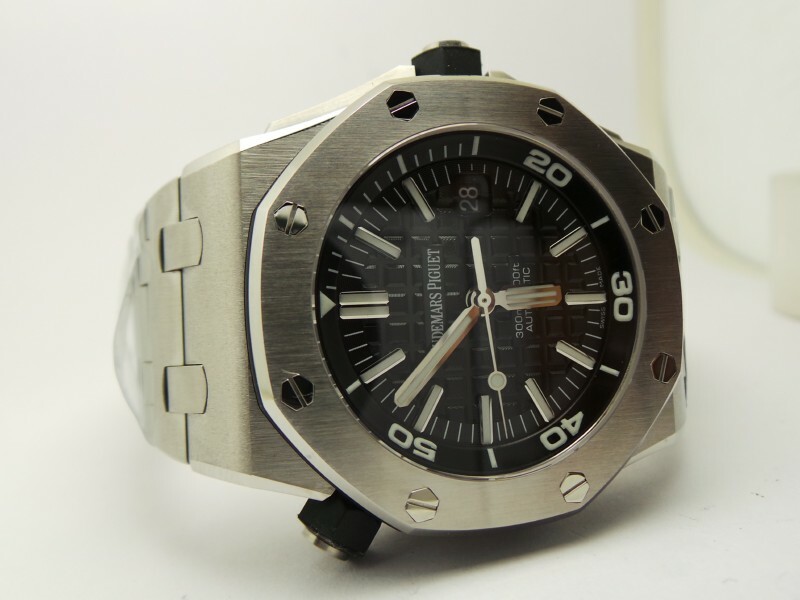 Audemars Piguet Diver is one of the mostly replicated watches in fake watch industry, many famous factories like Noob, J12 and H produced Diver replicas and they gained great success. 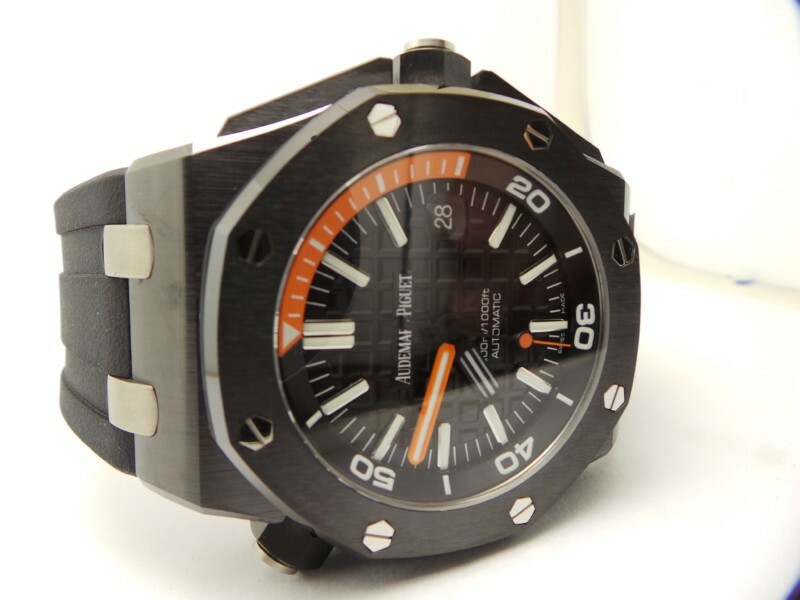 Audemars Piguet Diver replica has been improved so many times that each improvement caught a lot attention and discussed by watch fans passionately in various watch forums. 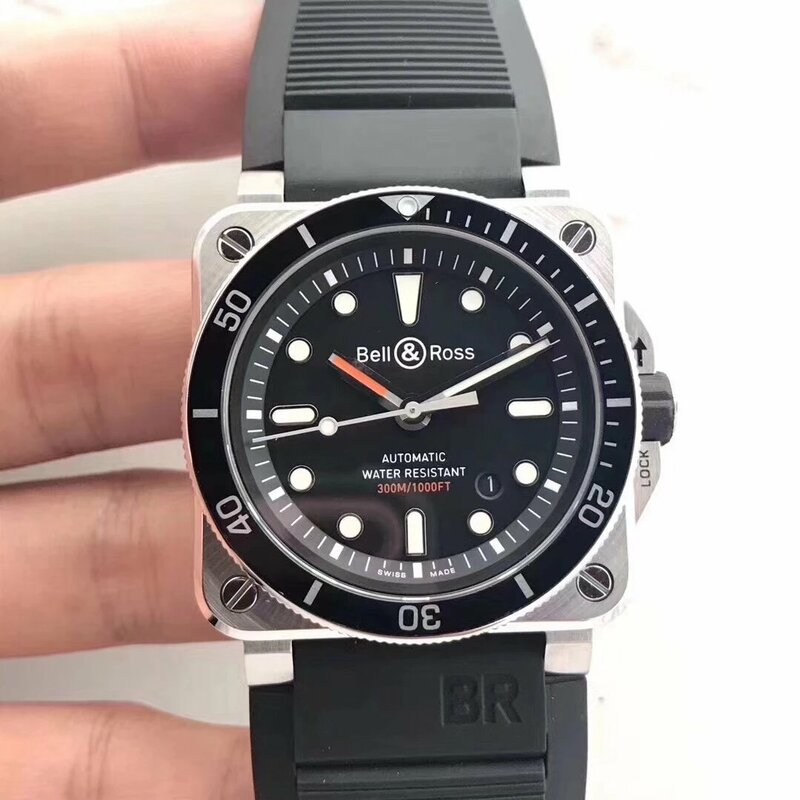 Besides the difference between replica and genuine Diver, the models produced by different factories also have some difference. 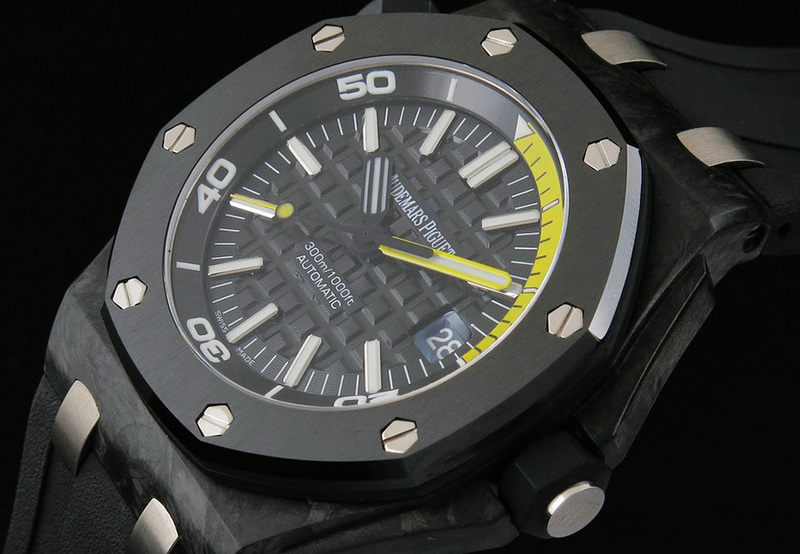 Among those AP Diver replicas, the best one I think should belong to the Diver made by J12 factory, also know as JF. 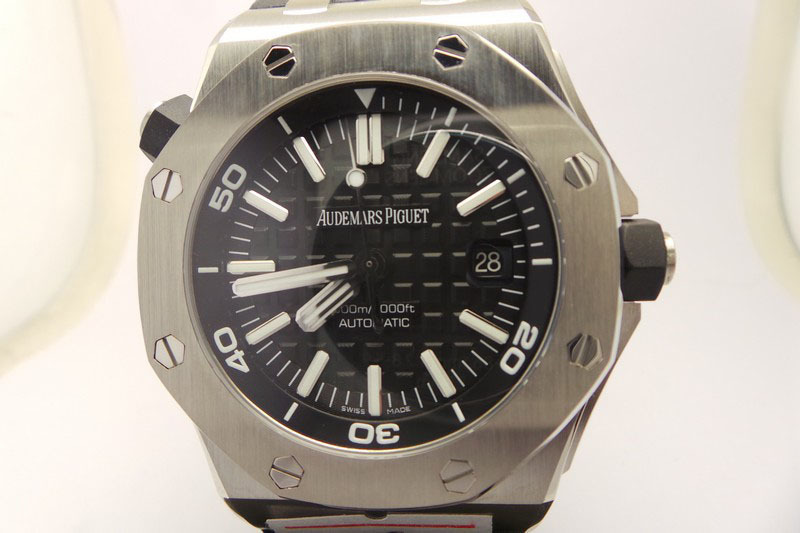 To tell whether a replica is low or high end, I think the most important thing is if it has an 1:1 replicated case, this Audemars Piguet Diver replica is the full stainless steel model, it is fitted with a steel bracelet with solid links, so the watch will feel much heavier than those Diver replicas with rubber strap. 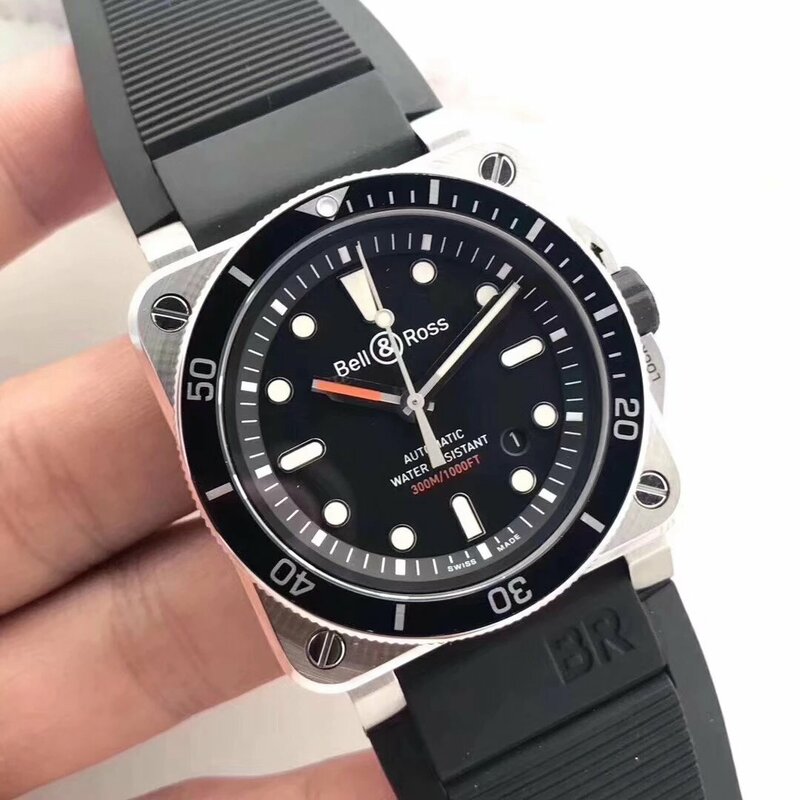 Actually this watch is more suitable to people who think their wrist are strong enough to hold such a big guy, it is undeniable that Diver rubber strap model is more loved because of sporty style. 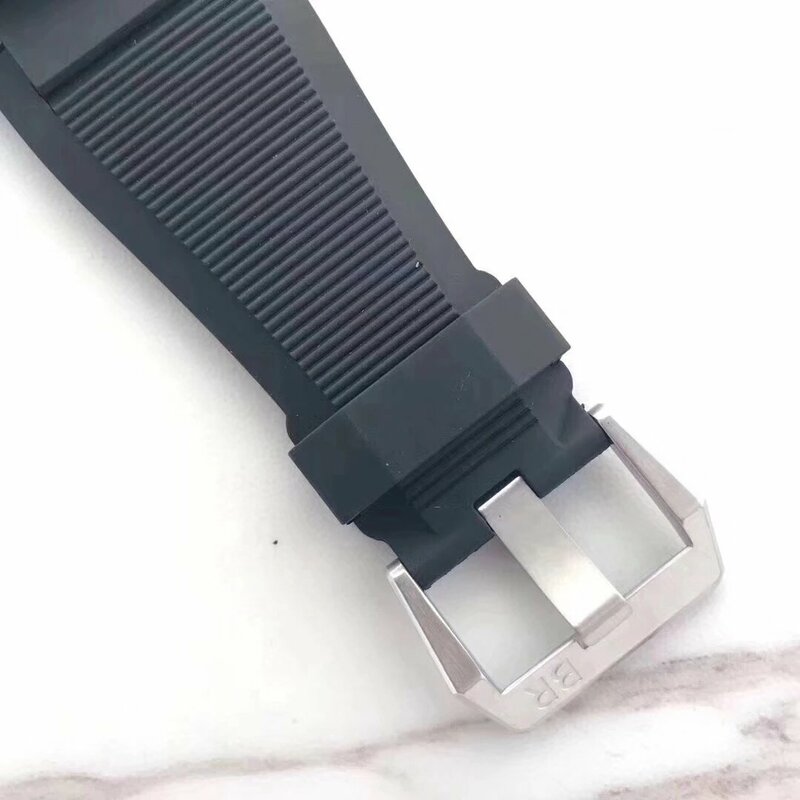 Beside the 1:1 replicated casing, other details like buckle, clasp and the engraving are also in good condition, if you have been in this area for years, you must know how well J12 polishes their bracelet, it always looks more high end than replicas made by other factories. 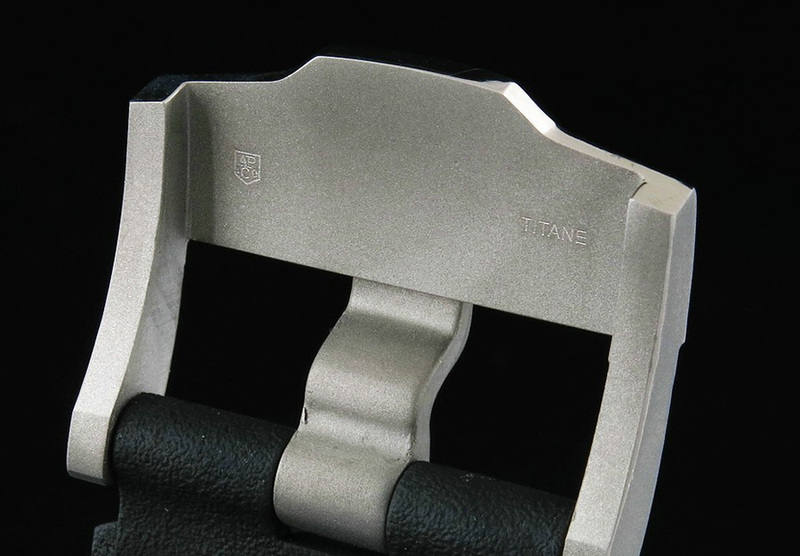 The AP engraving on buckle and clasp engraving all make the replica watch stand out among a lot poor or middle level of replicas. 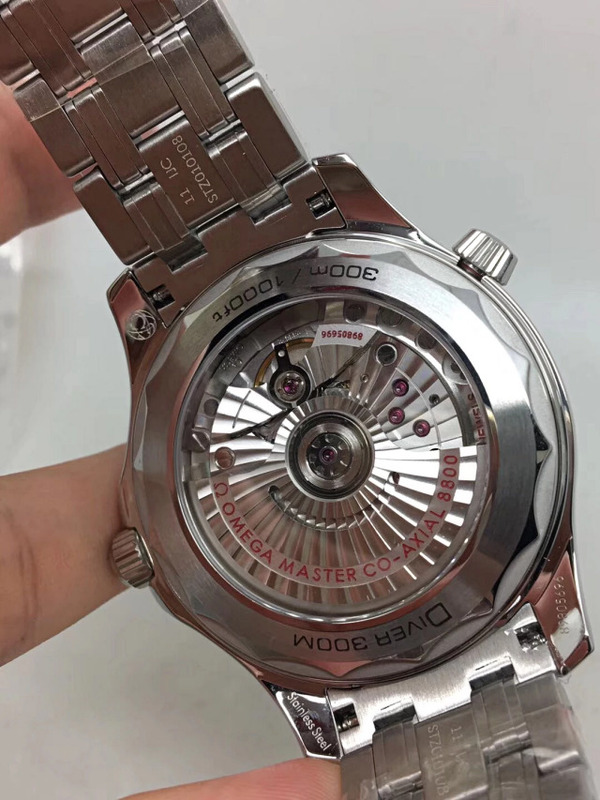 The movement inside the watch is Asian ETA 2824, which is mostly used in the replica watch world, featuring golden auto rotor that has vivid AP logo and other engraving, the movement is fixed by metal ring in the case, very stable, the screw down case back guarantees good water resistance. 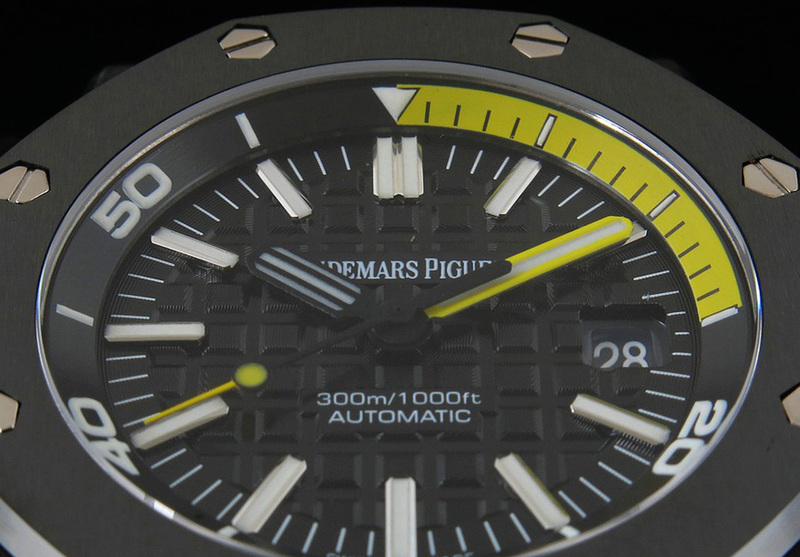 By the way, the replica Audemars Piguet Diver watch features a superlumed green dial lume. 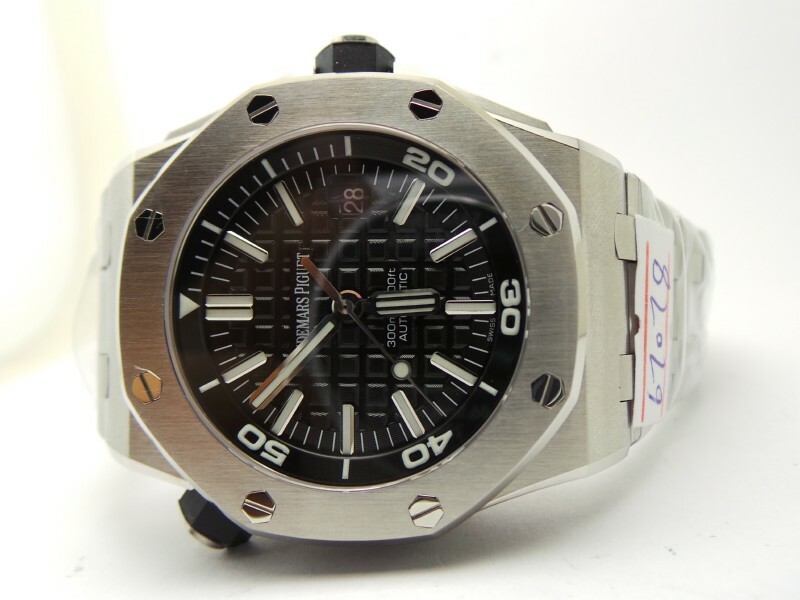 If you have searched many places and still can not decide on which diving watch to buy, this AP Diver replica may be a good start, although in a high price, it promises to bring you a happy experience of buying replicas for the first time.